Dermal fillers are a multi functioning treatment and can be used reduce deep lines and wrinkles, fill hollows and smooth the contours as well as adding or restoring volume to areas of the face such as lips or cheeks. At around the age of 25, the body stops producing collagen and elastin, the two proteins that work together to keep tissue firm and skin elastic, and the existing collagen in the body begins to break down. Without these two proteins, the body begins to display the typical signs of ageing (things like sunken cheeks, hollow eyes, deep lines and wrinkles) as the body no longer has a means of keeping tissue strong and skin supple. Anti-ageing facial fillers are a non-surgical solution to achieve younger looking skin and smooth tired lines and wrinkles, providing natural-looking rejuvenated outcomes. The majority of brands are made from hyaluronic acid. We use Juvéderm which gives an excellent natural rejuvenating result. An immediate, subtle, soft, beautiful freshening up of the face which will lead to long-term rejuvenation and restoration of the treated area. A softening of the naso-labial lines and a general lifting of the midface on both sides, improving the natural facial aesthetic. A sharpening of the contour of the cheekbones leading to a replacement of the “V” shape of the face, leading to an immediate more youthful appearance. A lifting of the mid and lower face, reversing the effects of ageing and leading to a more youthful appearance. An anti-ageing effect on the whole face with softening of other facial lines, such as the ‘crow’s feet’ that occur around the outer eye areas and that are known as the ‘laughter lines’. A fresher, happier, rejuvenated and younger looking patient with a very natural result in keeping with their age and natural aesthetic. We apply some local anaesthetic cream called LMX cream for 10-15 minutes. 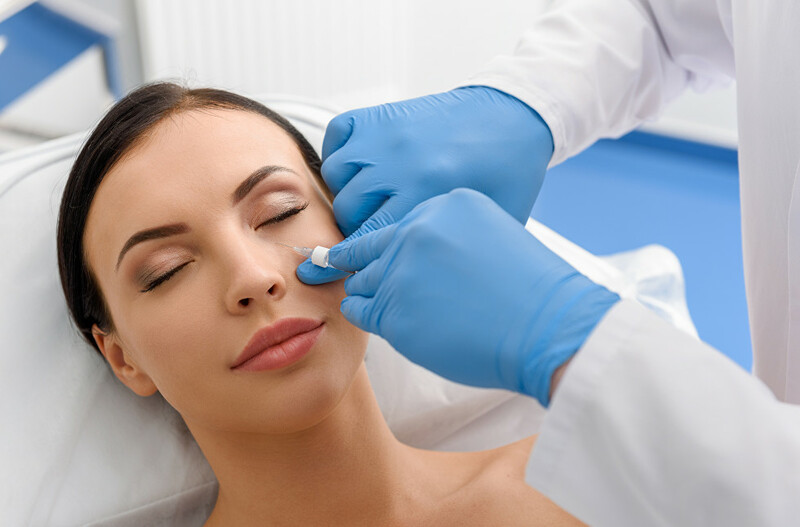 The product contains a naturally occurring substance called hyaluronic acid, is then carefully placed into the cheeks using an advanced medical aesthetics technique. Minimal pain – most patients grade the pain after the procedure as “2/10” on a scale from 0-10. Minimal time on the couch – The whole treatment takes less than 30 minutes. Minimal downtime – People go straight back at work the same day or following morning. Minimal bruising – We use some arnica cream post treatment as a routine preventative measure. Maximum patient satisfaction – Patients are invariably absolutely delighted and can see the visible aesthetic improvement in volumisation and contour immediately, making this amongst our most popular treatments. Avoid strenuous activity, including the gym, for 48 hours after treatment. Tyr and sleep on your back and semi-upright for 48 hours after treatment. Avoid sunbeds, saunas and extreme temperatures for one week after treatment. Use over the counter painkillers for any pain or swelling after treatment. Drink 2-3 litres of water per day for the next 4 weeks as hyaluronic acid-based fillers are hydrophilic, which means that they attract water, and this, in turn, enhances the result further. Use Vitamin C tablets at a dose of around 1000mg daily for the next 4 weeks. Vitamin C (ascorbic acid) stimulates collagen production and has been shown to be beneficial after dermal filler treatments. Regent Street Clinic™ offers a review of the result at three months and one year after treatment. AJ expressed an interest in freshening herself up for the festive period, during which time her extended family were gathering at her home, and she naturally wanted to look good. She commented that she had noticed the presence of “nose to mouth” lines on both sides of her face but more pronounced on the right side (where she slept). She did not want to undergo any surgical procedure and wanted to know if anything could be done to freshen herself up. As we age, there is a natural loss of volume in the fat pads in the cheek areas, known as the malar fat pads. These then start to thin and lose volume, resulting in the appearance of the face “sliding” down with gravity, creating the nose to mouth ridges (the nasolabial creases). Advanced and experienced medical aesthetics practitioners would refrain from simply injecting the nasolabial lines, as this does not address the cause of the appearance of the ridges. A smarter approach would be to revolumise the malar fat pad area with the aim of reversing the volume loss and subsequent “lifting” of the middle part of the face on either side. It is important to remember that hyaluronic acid (HA) based dermal fillers, such as Juvéderm, not only revolumise but they stimulate the body’s own cells that make collagen and connective tissue, known as the fibroblasts, that live in the skin, to become active in making more collagen. In other words, the treatment rejuvenates the skin and restores lost volume and lost skin quality. 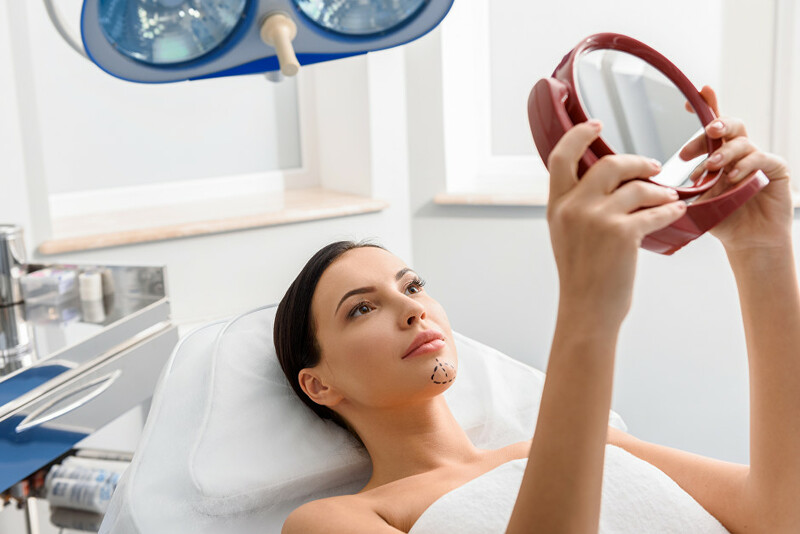 Hence there is an auto-corrective mechanism and the results of treatment are long-lasting such that there is always a residual improvement in the treated area. Mrs AJ was recommended to consider having a dermal filler treatment to her cheeks with the aim of freshening her facial appearance up as requested. She commented that it was crucial that she didn’t look ‘fake’ or ‘overdone’ and we were very sympathetic to that request, pointing out that the philosophy of our clinic is to achieve very natural looking results in a very subtle manner.